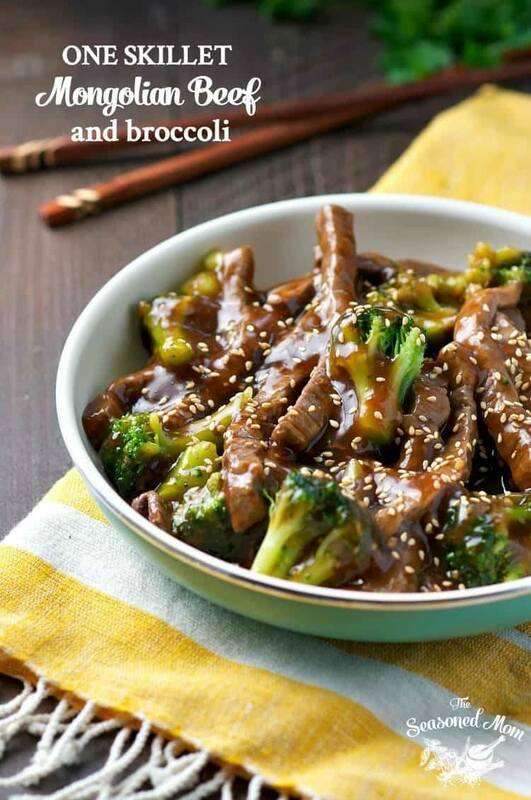 With just one skillet, 20 minutes, and a handful of pantry ingredients, my One Skillet Mongolian Beef with Broccoli is an easy dinner that the entire family will love! I think that the meat and veggies are great on their own, but my boys like to pile them high on top of sticky white rice – restaurant style! However you serve it, this weeknight Mongolian Beef is a simple and delicious meal that will satisfy your Chinese food cravings – no matter where you live! Prepare the Sauce: In a bowl whisk together soy sauce, water, cornstarch, ginger, garlic, and brown sugar until completely combined. Set aside. Heat 2 tablespoons of canola oil in a large skillet over high heat. Add the broccoli and stir for about 1 minute. Remove to a plate and set aside. Add meat to the skillet in a single layer (still over high heat) and cook for about 1 minute – do not stir or move the meat while it is browning. Flip the meat, cook on the other side for about 30 more seconds, and then remove to the plate with the broccoli. Pour the sauce into the skillet and bring to a boil, then allow to simmer while whisking until the sauce thickens (about 1-2 minutes). If the sauce gets too thick, just add additional water until it reaches desired consistency. Add broccoli and beef back to the skillet and stir to coat with the sauce. Serve over rice.